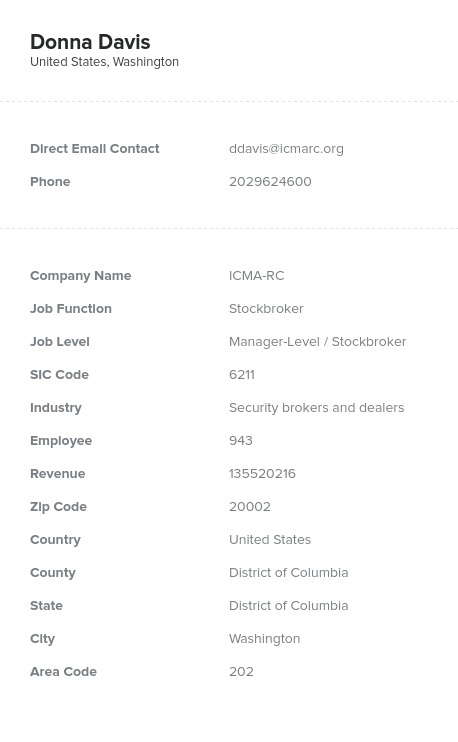 Find the powerful individuals at brokerage firms or dealers who trade stocks with the help of Bookyourdata.com’s ready-made, downloadable database. This extensive contact list of stockbrokers is perfect for those who are trying to reach out to this niche financial group. With this data product, you can find the phone numbers, titles, names, addresses, and emails of stockbrokers across companies. Bookyourdata.com's accurate, human-verified contact lists are full of the information you need to build strong business relationships. This list includes those whose job title is “stockbroker," which means that you can zero in your B2B marketing campaign and only talk to those in your specific, targeted audience. Bookyourdata.com's products aim to help you make connections with the right people so that you can network, find leads, and get new clients more effectively. We know that efficient B2B campaigns are targeted and laser-focused, which is why we offer our uniquely targeted lists. Either use this pre-built directory of stockbrokers or customize your own list so that it includes the potential reach of your entire campaign. With our email list of stockbrokers, you can market useful stock-monitoring software, offer the best real-time IT solutions, or tell them about an outsourced accounting service. No matter the reason why you're connecting with this highly adept financial group, this list provides the most important information so that you can start the conversation. Download it now and start marketing in minutes!